Barrel: 10.5" 4150V Chrome Moly vanadium steel barrel, nitrided and chambered in 300AAC Blackout with a 1 in 8" twist. The pistol-length gas barrel is finished off with a PSA 12" Slant End M-lok Rail, a low profile gas block and a PSA Fluted Flash Can. Flash Can: Palmetto State Armory's Fluted "FLASH CAN". This is a solid 6061 aluminum device that is designed to direct muzzle gases and the muzzle flash forward. Threaded 5/8-24 for 300AAC. Black military-style hard anodizing. 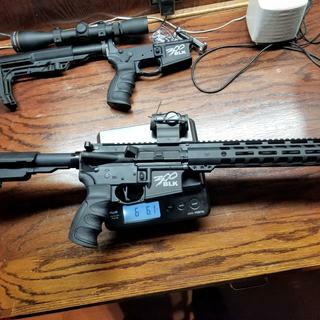 THIS DEVICE IS NOT DESIGNED TO REDUCE RECOIL, MUZZLE RISE, OR FLASH SIGNATURE. This device is designed to direct gasses and noise forward away from the shooter and enhance the weapon's appearance. Bolt: Bolt is made of Mil-spec shot-peened Carpenter 158 steel. Gas key is secured with grade 8 fasteners and staked per mil-spec. Will a Dead Air Sandman S suppressor fit under the hand guard? BEST ANSWER: Would help more if you stated the outside diameter of the suppressor. Does this shoot #3 buchshot? And can you convert it to a 50 caliber? Will a muzzzle attachment with a 1.5” O.D. Fit inside this rail? And what is the I.D. of this rail? Will a TBAC 30P-1 fit under the handguard? It is 1.5" in diameter. 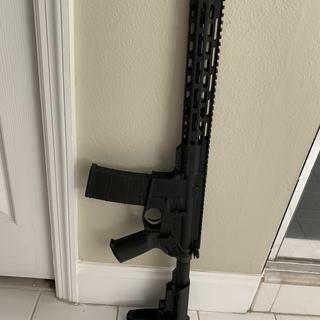 Does anyone know if the buffer tube is milspec and can accept a different stock if decided to SBR or different pistol brace? BEST ANSWER: The SBA3 is a pistol brace designed to be on a mil-spec carbine buffer tube. So yes, this will work if you fill out a stamp. 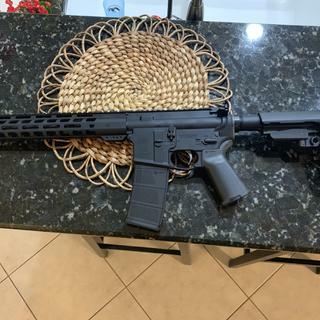 How ever, with the short turn around of E-file stamps (one month or so), I would get the lower and fill out the stamp paperwork, than build as a rifle if that is your intent. Yes, it's in the description. Is the Bolt Carrier nitride or phosphate? Dude it doesn't come with a bolt carrier. Does this include the gas block and tube? And does it include a complete BCG? Is the flash can pin/weld? And if not what muzzle break is on the barrel? BEST ANSWER: Nothing is permanently attached. The entire upper can be (and I have) disassembled. on mine the hand guard is not welded to the upper, nor is the flash forwarder welded to the barrel. BEST ANSWER: The gas block is not adjustable. What else do I need to complete the build? Why no chrome lining the barrel? 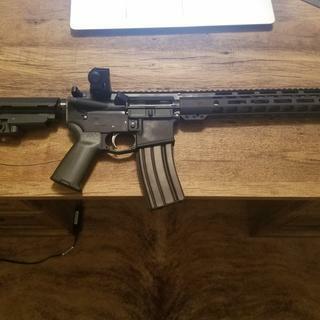 What’s a good stripped lower for this? Will a Silencerco Omega 300 cal noise suppressor fit under the M LOK rail? the quality was better than i expected and it performed flawlessly. 100 rounds with no issues. mated up to a spikes tactical phu lower receiver that fits like a glove. couldnt ask for more. Nice build kit. Pleased with the result. Parts are decent quality. 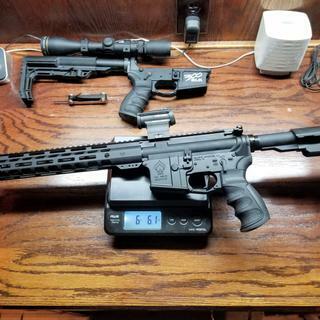 Everything was there and good fit my Ballistic Advantage lower receiver. I upgraded trigger, mag release and grip as shown. Amazing price and great quality. I used a standard stripped fire/safe lower from PSA to keep it a matching build. The finish was perfect on all the parts I received. Flash can gives it a nice look. Incredible value. Quality of materials is first rate. Fit and finish is excellent. What I received is flawless. Packaged carefully and shipped quickly. I would definitely recommend to a friend, or anyone for that matter. I'll probably get another, assuming they can keep them in stock long enough. Received the kit yesterday. Took some time to ship out, but not too bad. Put it together and everything is good. The trigger is heavy. Haven't checked it yet, but I wouldn't be surprised if it's around 8 lbs. The reset is pretty loud and clunky. Not a deal killer, since I wasn't planning on keeping this trigger long, but it is a disappointing trigger. My first impression is disappointment. Received this today, upon inspection found shiny tool marks on bottom of flash can, also flash can is NOT centered inside the rail. When handling, the side of the flash can contacts the end of the rail creating this annoying noise as though something is loose. Inspected barrel and found no stamping or any identifying information as to what caliber this is. At this point I'm disappointed, if this was sold as a BLEM I could be more understanding, however I definitely was expecting better quality. I will update this review as I progress with the build.